When contacting us by e-mail, correspondents are asked to include their name and full postal address and, when providing information, to quote exact book and magazine sources. The word ‘chess’ needs to appear in the subject-line or in the message itself. For a photograph of the occasion, see the front cover of the 7/1988 New in Chess. 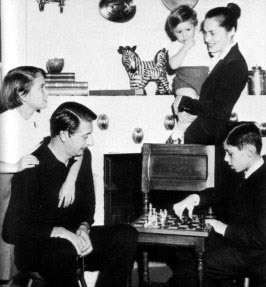 Two fine photographs of Nimzowitsch and Réti which we have occasionally reproduced from pages 159 and 82 of Alt om Skak by B. Nielsen (Odense, 1943) prompt a question from Maurice Carter (Fairborn, OH, USA): bearing in mind that the chess sets and boards appear to be identical, on what occasion were the photographs taken? 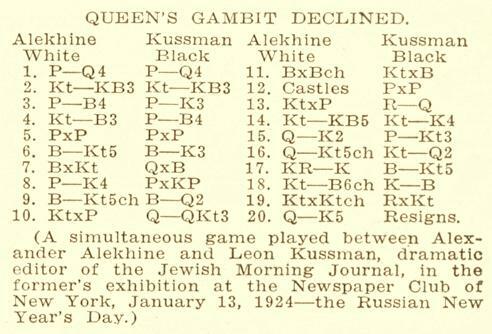 Our source was the June, July and August 1909 issues of the American Chess Bulletin, which omitted the timings only for game 16 (a draw at the Brooklyn Chess Club on 21 May). Information for that game was also absent from the table on page 6 of Imre König’s book on the match (San Francisco, 1955). 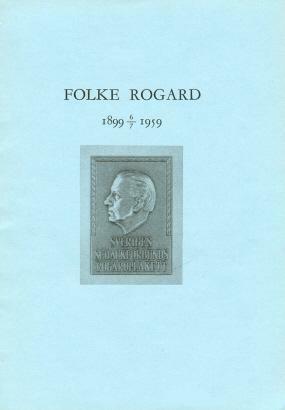 The match book published in Stockholm in 1916 gave no clock times. Is there any hope of finding the missing details for game 16? 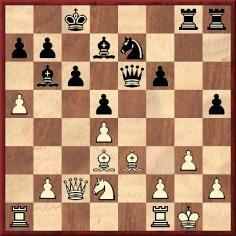 19...h4 20 Rfe1 hxg3 21 fxg3 Rxh2 and wins. What is known about the game? It was still being given, in unchanged format, in much later editions of Salvioli’s book. See, for instance, page 546 of the eighth edition (Florence, 1961). ‘Fred had what he thought was a headache, which turned into an earache. On Saturday [sic] night, he fell asleep. He never woke up. Death had been caused by an aneurysm. Our Factfinder has an entry ‘Reinfeld, Fred (when he learned chess)’. In none of his contradictory claims did he profess familiarity with the game at such an early age. 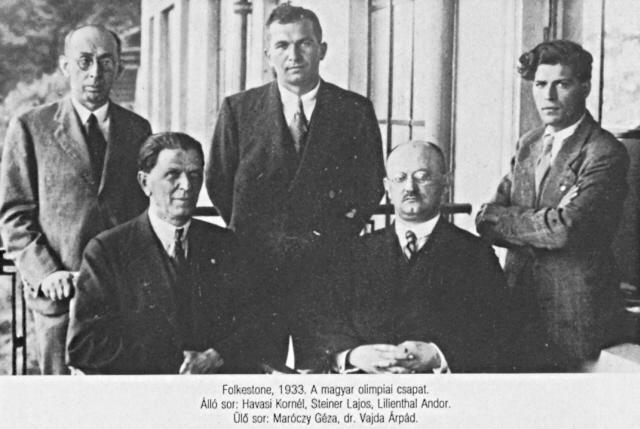 Zdeněk Závodný (Brno, Czech Republic) notes that the same photograph of Réti, although showing more of the board position, was published in the 11 June 1929 issue of the Czech magazine Letem světem. 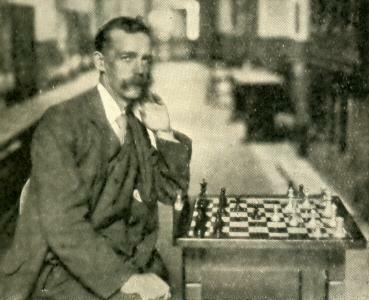 Page 27 of The Even More Complete Chess Addict by M. Fox and R. James (London, 1993) stated that John Reginald Halliday Christie (who lived at 10 Rillington Place) ‘was a goodish chessplayer’ and that ‘Whilst awaiting the ultimate punishment in Brixton, he passed the time thrashing his warders at chess (Chris the chess champion, they nicknamed him).’ The grounds for these assertions remain to be discovered, since much of the book is a source-free zone. 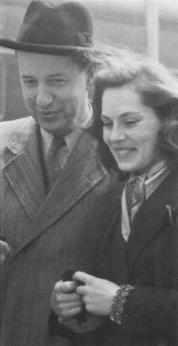 1947, São Paulo: M. Najdorf (45). 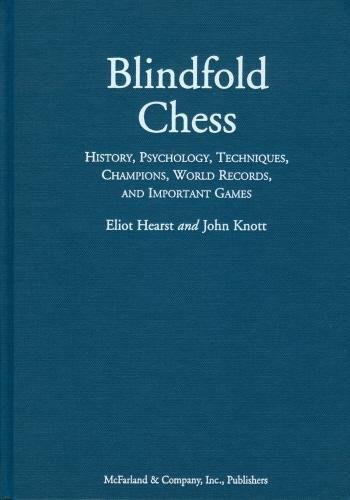 Blindfold Chess includes the available particulars in each case, and the first section (pages 207-312) of Part III presents all the game-scores traced from these exhibitions – about 300 games in all. The above list omits the display by János Flesch (supposedly 52 boards in Budapest in 1960) for the reasons discussed on pages 99-110. The last two pages of that section have a report entitled ‘A Sensational Postscript: Flesch vs Barcza! 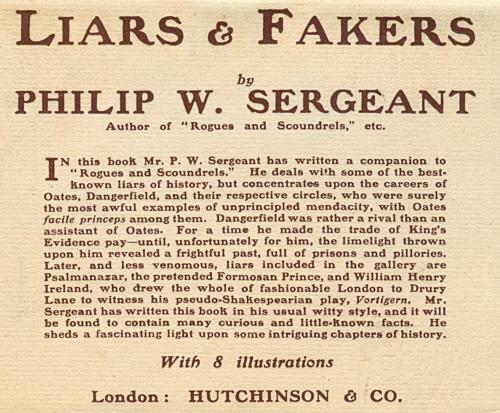 ?’ which relates that four Hungarian contacts independently told the co-authors that a year or two after Flesch’s exhibition Gedeon Barcza described Flesch as a ‘crook’ and a ‘fraud’ and was then sued by Flesch for defamation of character. Whether any such case went to trial has yet to be established. Can it be hoped that a researcher in Hungary will look into the matter? 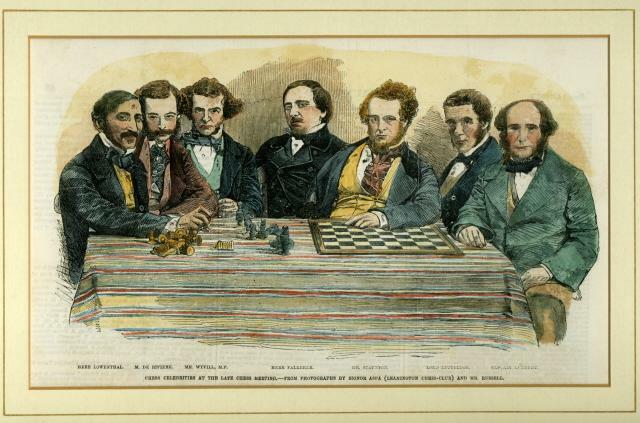 Gordon Cadden (Newport, Wales) asks whether New York, 1857 (see C.N.s 3828 and 4780) is the first occasion when identifiable chess masters (e.g. 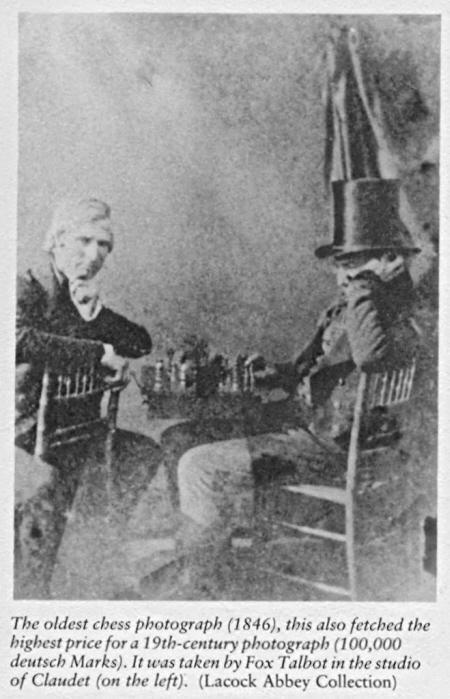 Morphy and Paulsen) were photographed. 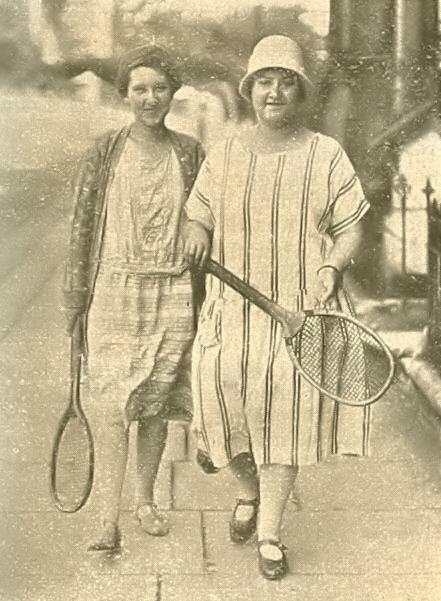 We can think of no earlier case but wonder whether the picture below of Staunton has been authoritatively dated, with firm information on its provenance. 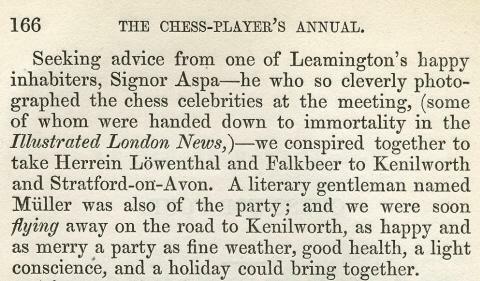 It became well known after appearing on page 102 of David Lawson’s 1976 monograph on Morphy. C.N. 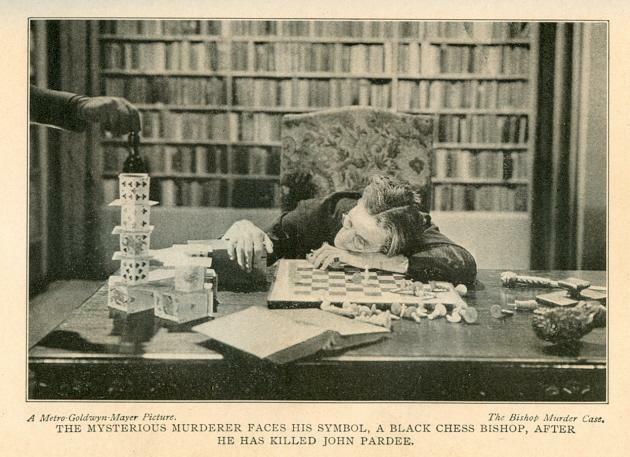 3190, an item no longer on-line, listed the non-chess books by P.W. Sergeant in our collection. One title acquired since then has been added below, and we believe that the list is now complete. Witches and Warlocks (Hutchinson & Co., London, 1936). The list does not include recent reprints; the most common of these is Witches and Warlocks, of which a paperback edition was published by Senate, London in 1996. Yasser Seirawan (Amsterdam) asks, following on from C.N. 5932, which future world champions played previous title-holders in simultaneous displays. Readers’ help in drawing up full details will be welcome. 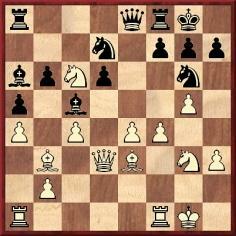 A familiar case is Botvinnik’s defeat of Capablanca in Leningrad in November 1925. As mentioned on page 105 of our book on Capablanca, it has also been claimed that in 1920, when not yet world champion, the Cuban drew with Euwe. 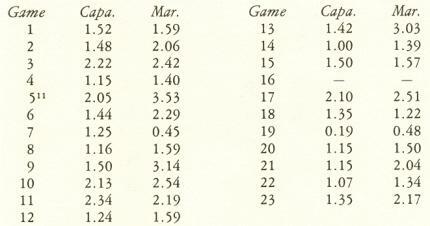 See page 95 of volume two of Around The Chess World in 80 Years by N.J. Divinsky (St Leonards on Sea, 1965). Can any more details be found about the occasion and Black’s identity? Moreover, to what extent was the game known before Bronstein published it on page 13 of his book 200 otkritikh partii (Moscow, 1970)? 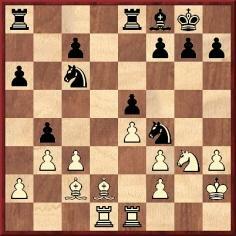 1 e4 e5 2 Nf3 Nf6 3 Bc4 Nxe4 4 Nc3 Nxc3 5 dxc3 d6 6 Nxe5 Qe7 7 Bxf7+ Kd8 8 O-O Qxe5 9 Re1 Qf6 ‘and White announced mate in 11 moves’. 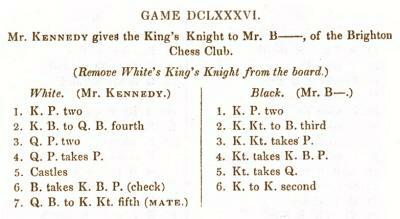 However, this is not an instance of an announced mate which is longer than the game itself (see page 164 of Chess Explorations, pages 8-10 of Kings, Commoners and Knaves and page 50 of A Chess Omnibus), because from the diagrammed position there is a mate in nine. 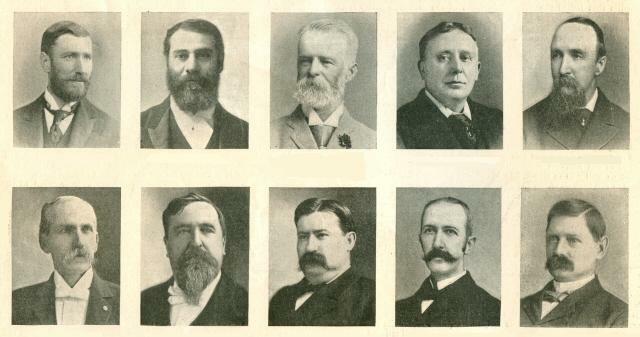 Into which of our feature articles will this set of photographs be incorporated shortly? 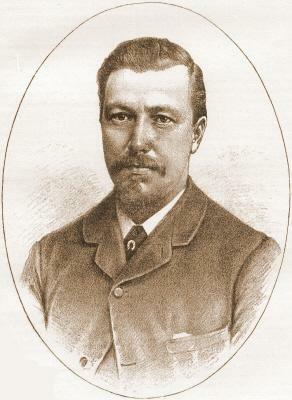 Albert Frank (Brussels) asks which crime novel featured A. Troitzky’s famous study (Novoye Vremya, 1895) with mate administered by a single bishop. A photograph of Alekhine with the novelist was given in C.N. 5126. 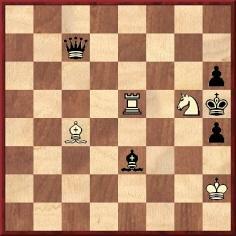 Daniel v Grant, correspondence, 1911-12 (14 moves played, and White announced mate in 21). The accuracy of the last two cases has yet to be demonstrated. In the light of a comment received from Stephan Bird (Caernarfon, Wales) we clarify that in this topic ‘announced mate’ refers to a correct announcement of the shortest possible forced mate. 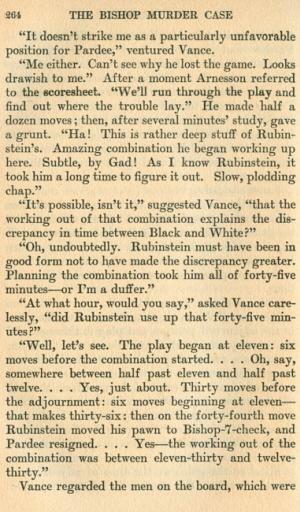 ‘... we well remember his giving a “simultaneous” at the Lincoln Chess Club in 1924, winning 17 and drawing two. 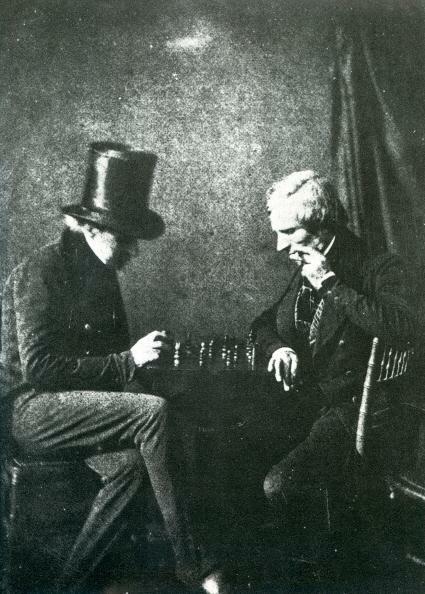 One of his more elderly opponents (a notorious non-resigner) who for 30 moves had been wobbling along with a piece down until “time” had to be called, then proceeded to “demonstrate a draw” by concocting a continuation so optimistic that even clubmates with lifelong experience of his powers stood aghast. Atkins, with his greatcoat on ready to go home, made no attempt to refute this analytical masterpiece but merely remarked with great deference: “I don’t think we can play it quite like that!” and then beat a craven retreat “escorted by Club Officials”. Marc Hébert (Charny, Canada) notes on page 192 of the 14/2007 Quarterly for Chess History a reference to ‘Aleksander (actually – Avrohom) Flamberg’ and asks for further information on the forename. Karpov v Kasparov, Leningrad, 1975. Acknowledgments: Javier Asturiano Molina (Murcia, Spain), Eduardo Bauzá Mercére (New York, NY, USA) and Hassan Roger Sadeghi (Lausanne, Switzerland). 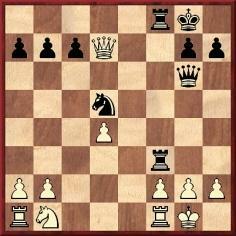 This position occurred after 21 Rfe1 in Tartakower v Réti, New York, 1924. 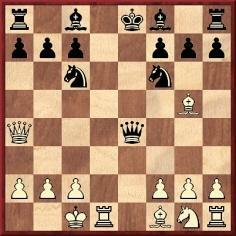 Black played a rook to d8, but which rook? 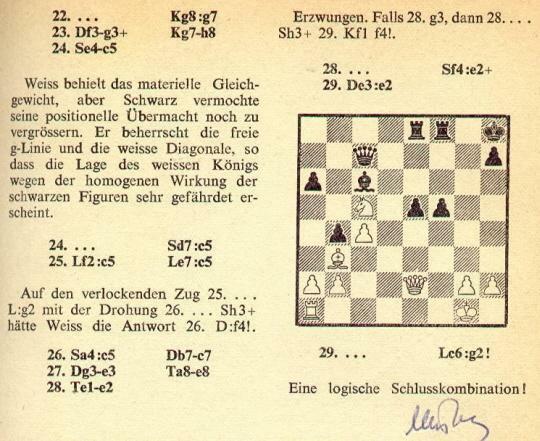 Tartakower annotated the game, which he lost, on pages 220-222 of the August 1924 Wiener Schachzeitung. 21...Rad8 was the move given, with an exclamation mark. It may therefore be strongly suspected that 21...Red8 in the English edition of the New York, 1924 book was wrong, possibly owing to a misunderstanding and/or translation error, but the matter has yet to be put beyond doubt. 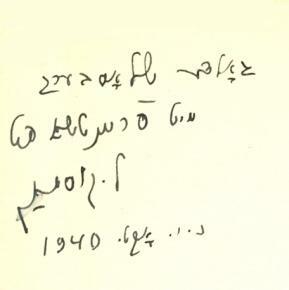 Notwithstanding the quality of Alekhine’s annotations, the book was a lax production. C.N. 2131 (see page 283 of Kings, Commoners and Knaves) mentioned that W.H. 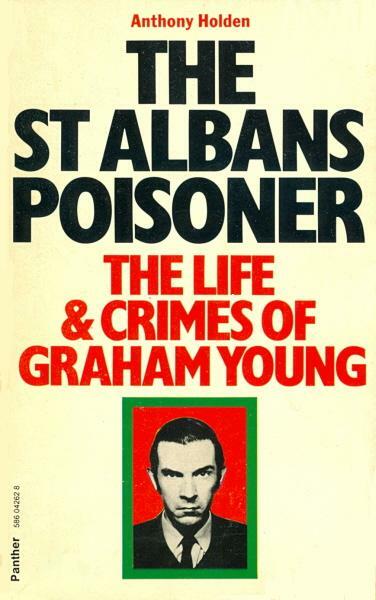 Watts added a nine-page errata supplement (to the British edition, of which he was the publisher). The list sheds no light on the ‘Which rook?’ puzzle but is, of course, indispensable in connection with any English-language edition of Alekhine’s book. 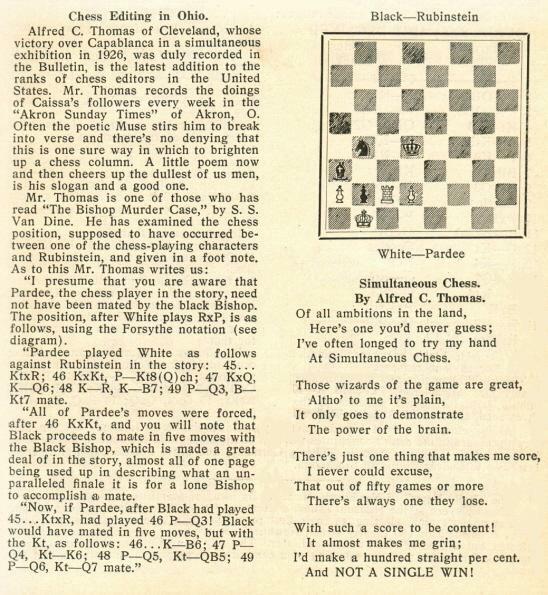 American Chess Bulletin, July-August 1925, page 123. 25 Rg1 Qd2 26 Rxg7+ Kh8 27 f6 Qf4+ 28 Qxf4 exf4 29 fxe7 Kxg7 30 exf8(Q)+ Kxf8 31 Ba2 Rd2 32 Rc1 Rxf2+ 33 Kg1 Re2 34 Bb1 Rxe4 35 c3 Re3 36 Bf5 c5 37 Bc8 a5 38 Ba6 b4 39 axb4 axb4 40 cxb4 cxb4 41 Bxc4 Rc3 42 Rxc3 bxc3 Drawn. 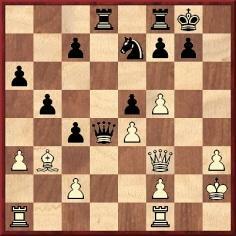 12...Kf5+ 13 Ne3+ Ke5 14 Nc4+ Kf5+ Drawn. We have still found no other games which finished with, in Assiac’s term, ‘double-perpetual’. Frederick S. Rhine (Park Ridge, IL, USA) recalls a passage from page 153 of Pollock Memories by F.F. 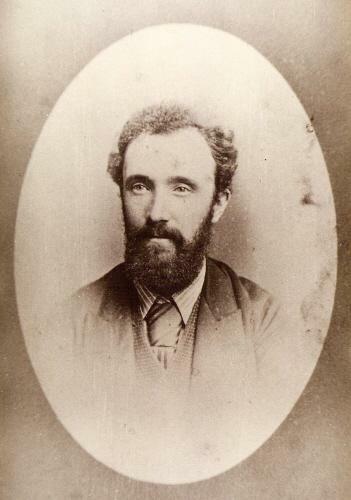 Rowland (Dublin, 1899). The writer is Pollock. Our correspondent asks whether more is known about Loyd’s construction. 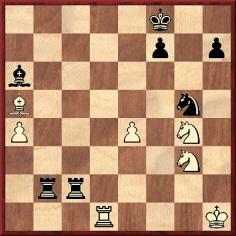 White to move and draw. Solution: 1 Bf7+ Kg4 2 Be6+ Kf4 3 Rf5+ Kg4+ 4 Re5+ Kf4 5 Rf5+. 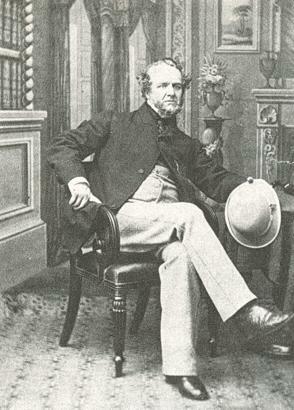 ‘I believe that the photograph of Howard Staunton in C.N. 5942 (above) was used as a basis for an engraving by, if I read the initials correctly, P.M.E. Taylor. 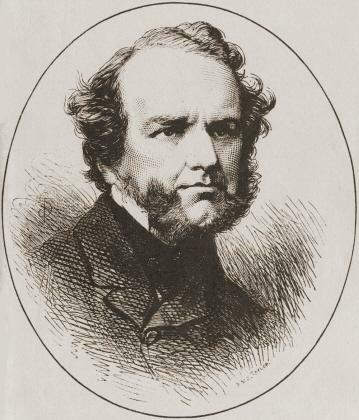 The engraving appeared in Staunton’s obituary in the Illustrated London News of 4 July 1874. This says nothing about the date of the photograph, but it seems more likely to be from the early 1860s than near his death. 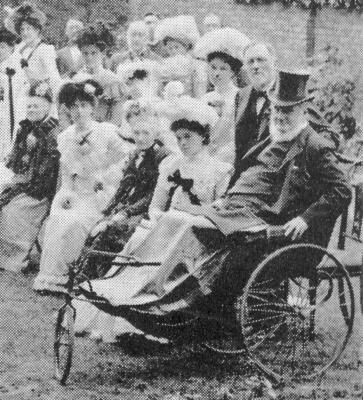 Staunton looks younger than he does in the group photograph from Redcar, 1866 in C.N. 5614. 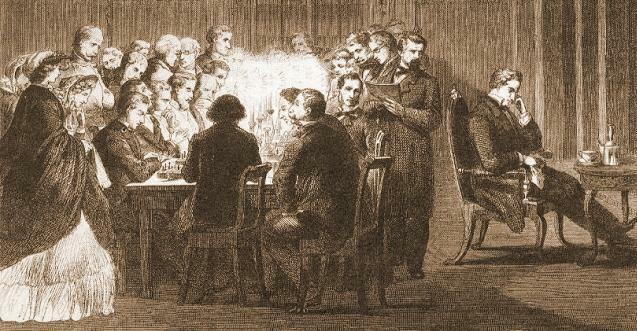 “The cuts with which this work is embellished have been engraved by the well-known Brothers Dalziel. The portrait of Paul Morphy, copied from a photograph taken shortly after his arrival in London last year, is an excellent likeness. The photographs themselves, therefore, may have gone unpublished. Is it known what became of Aspa’s archives? 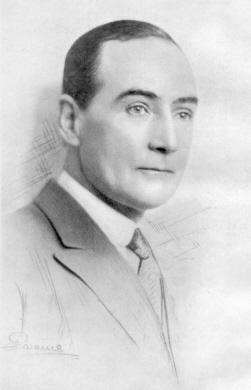 (His obituary on page 231 of the June 1905 BCM reported that he died in Leamington.) Our correspondent’s quotation from the Edge book is also of particular interest and relevance. 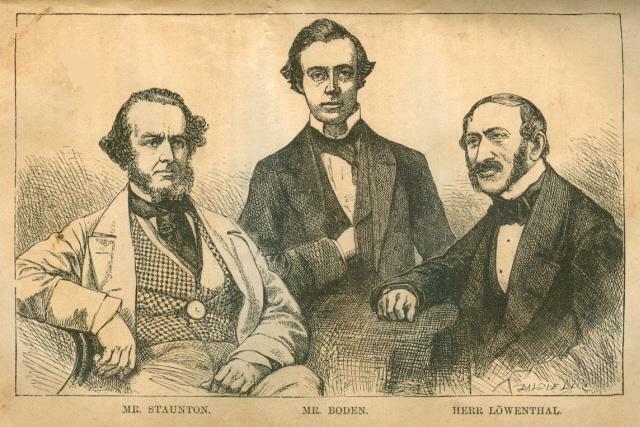 Is any further information available about the photographs for which Staunton, Boden, Anderssen and Löwenthal sat in Manchester in 1857? 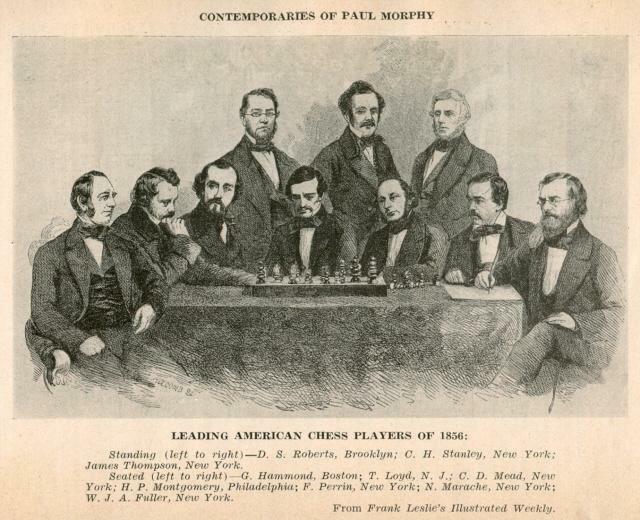 The tournament took place several months before New York, 1857 (a photograph from which was referred to in C.N. 5942). 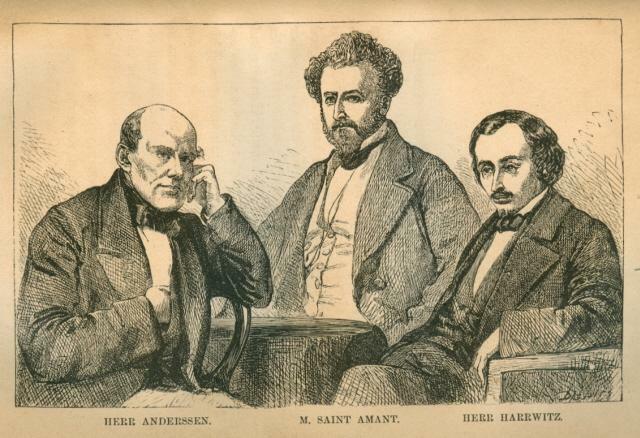 From opposite pages 96 and 150 of the 1859 US edition of F.M. 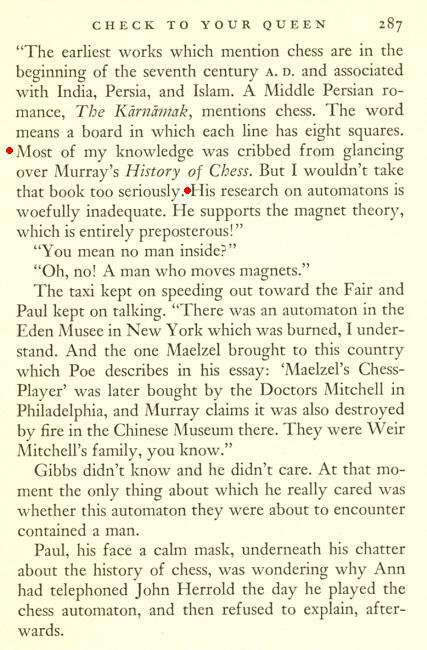 Edge’s book on Morphy. Source: Combinations The Heart of Chess by I. Chernev (New York, 1960), page 124. This set of photographs has now assumed its proper place in a feature article. 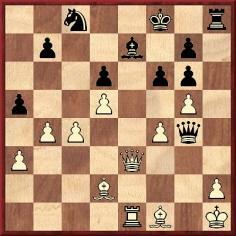 38...Bd3 and White resigned after two or three further moves. Source: Le Palamède, January 1847, pages 34-35. 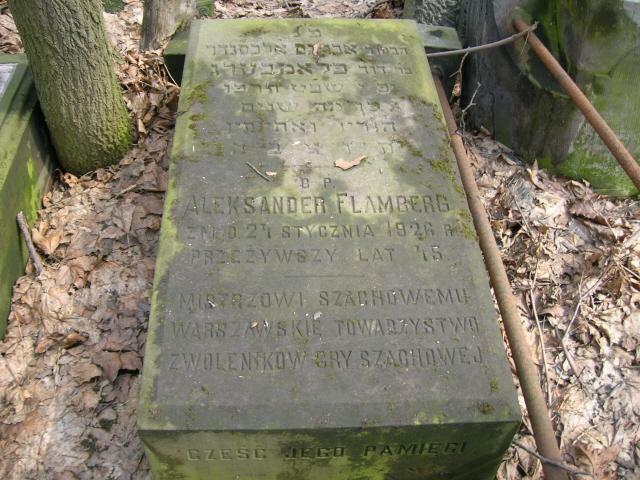 ‘Flamberg, like many European Jews, had two forenames – one “Jewish” (Avrohom) and one “Gentile” (Aleksander). The point of such double names (usually beginning with the same letter) was to make assimilation easier. 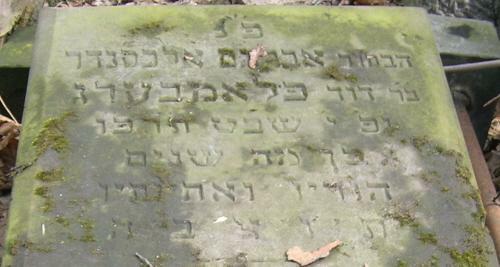 One would use the Jewish name within the Jewish community, especially for religious purposes, and the Gentile one within the larger, Gentile world. Russell Miller (Camas, WA, USA) informs us that the ancestry.com webpage offers basic information about Leon Kussman, such as his dates: 1884-1977. One of T.H. 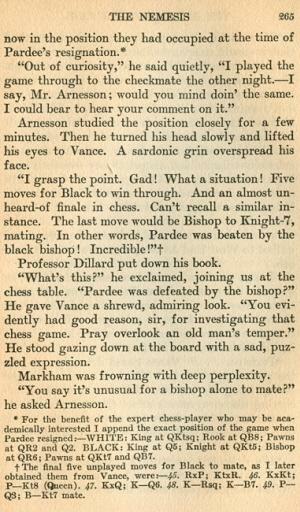 Tylor’s very rare forays into chess writing was ‘The Grand Masters’ on pages 26-29 of the anthology Home and Away (London, 1948). 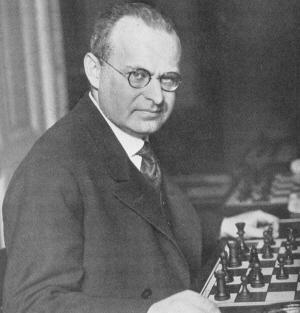 Directed at a mainstream audience, the article contained little that is quotable, although on page 28 he described Alekhine as ‘perhaps the greatest chess genius of them all’. 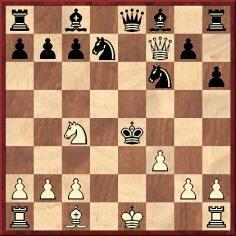 30 c5 Qd7 31 Bg2 axb4 32 c6 bxc6 33 dxc6 Qc7 34 axb4 and White won. 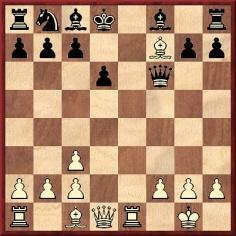 The way three black pieces arrive on the third rank is certainly attractive, but such a game would hardly be praised so highly nowadays. 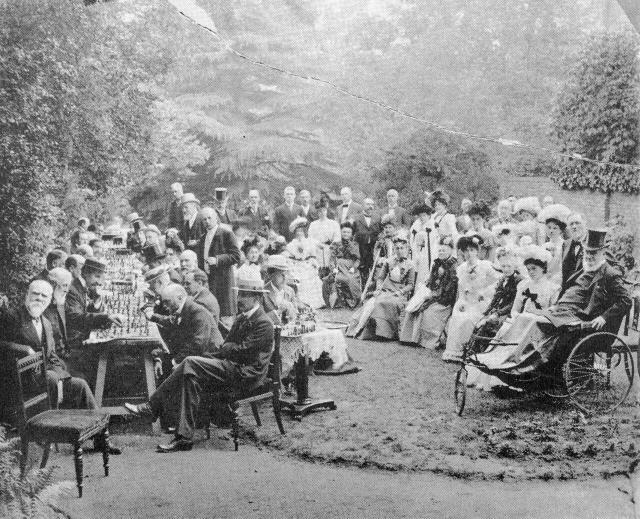 She believed that the above photograph was taken in the garden of a chess club in Nightingale Lane, Balham, the man in the Bath-chair being identified as H.E. Bird. 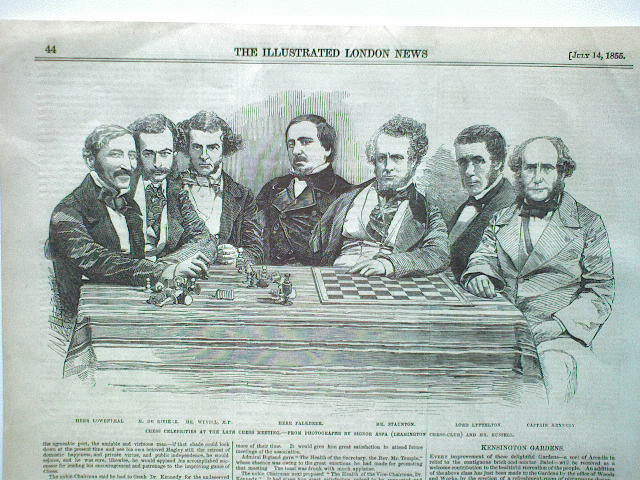 On page 360 of the 20 August 1964 CHESS a reader, Alfred Milner, suggested that in the first photograph J.H. 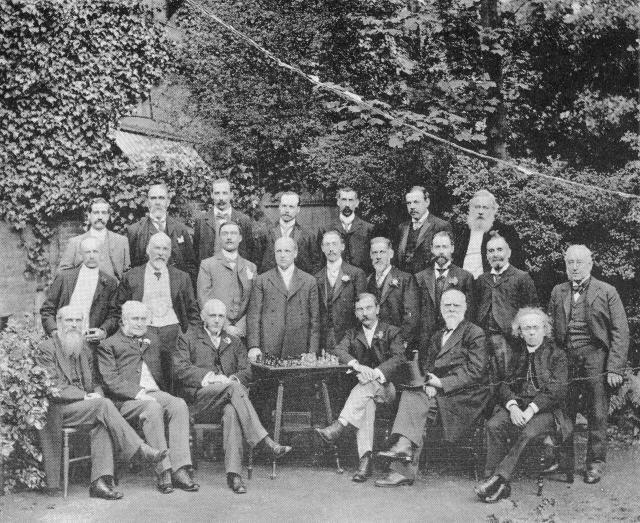 Blackburne was ‘the gentleman in a white trilby watching the games’, and he noted that the man on the extreme left in the first photograph seems to be seated second from the right in the other shot. Tom Brown (Baltimore, MD, USA) asks about the origins of the chess terms ‘rank’ and ‘file’ and how their dating compares with that of the military phrase ‘rank and file’. 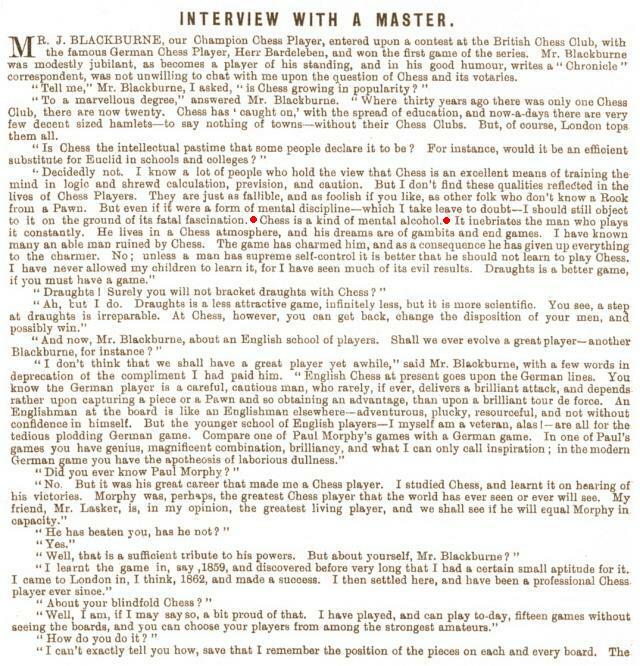 Source: Chess Player’s Chronicle, 21 August 1895, page 243. Page 207 credited the photograph to the ‘Archive Motovun Verlagsgesellschaft, Lucerne’. Antoine Claudet (1797-1867) was a French photographer. 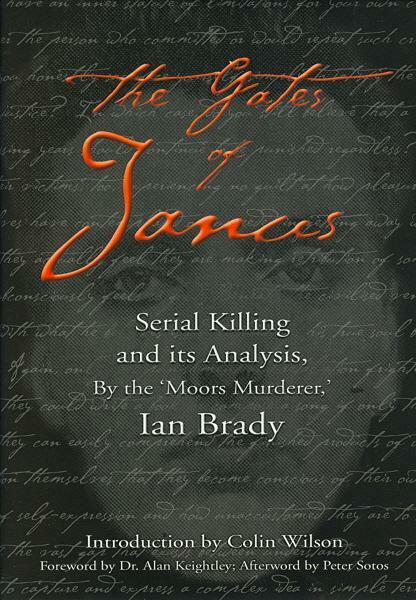 ‘On page 287 of Means Davis’s novel The Chess Murders (New York, 1937) a character remarked regarding H.J.R. Murray’s work: “I wouldn’t take that book too seriously”. 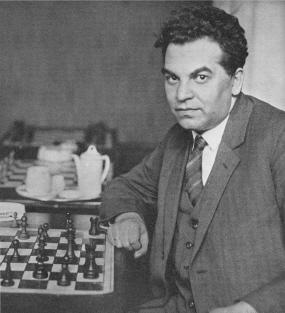 Ernest Tomlinson (Seattle, WA, USA) wishes to know the source of a quote commonly attributed to Mikhail Tal. Concerning a campaign in the Soviet Union against alcoholism, he supposedly commented that if the State was against vodka, he was on the side of vodka. Copyright: Edward Winter. All rights reserved.